Microsoft Access help usually requires a separate help file be created using one of a number of tools available to create the file. 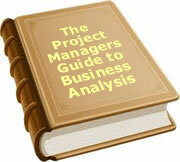 Each text box or combo has to have information in the properties detailing the help file. This help function uses a different approach. It stores the help information in a table within the application. Users can update the help with tips and information themselves. If you do not want them to update the help, change the edit button visible property to not display. A sample database is available to download. I will outline the key parts of the application below. The table is simple in that there are only three fields. The field HelpRef is a combination of the form and field name separated by a dash. 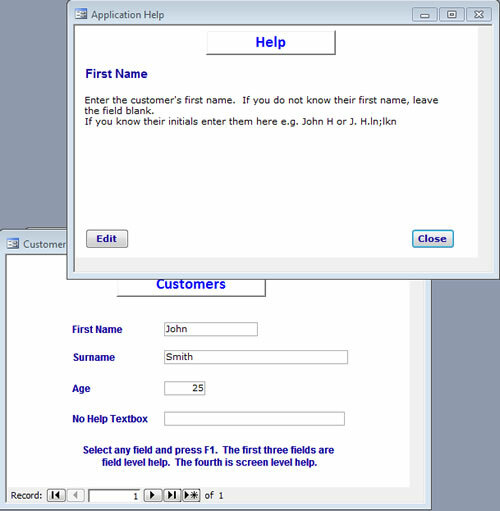 For example if a form frmCustomer had a field called txtSurname, the HelpRef would be frmCustomer-txtSurname. In order for the forms to display help, you need to intercept the F1 key before it fires up Access Help. To do this, you change the Form.KeyPreview to "Yes" and use the Form.KeyDown function to change KeyPress to 0. You then call subGetHelp. Paste the following code into your form KeyDown. Remember to change the form KeyPreview to "Yes".
' which displays the appropriate help information. Create a new module called modHelp and paste the code below into the module. The code creates a string called strHelp which is a combination of form and field name. This is what is stored in the table as HelpRef. The code uses a few functions such as funIC which is a short function to insert inverted commas. Just lazy I guess playing. Avoids around with lots of inverted commas in a cancatenated string. It also uses funRecordCount which returns the number of records in the recordset. SubOpenForm is just a generic version of the DoCmd.OpenForm command which has some error trapping. All are in a module called modGeneric. There are three stages. First it searches within tblHelp.HelpRef for a combination of form-field. If it is not found then it then searches for just form. If neither is found, it displays a message that no help exists. Screen.ActiveForm.Form.Name & "-" & Screen.ActiveControl.Name. If the form is not the active screen it will fail. If you do want to step through the code, pause after the line above has processed.
' the field txtSurname the help table primary key is "frmCustomer-txtSurname".
' screen under a primary key of "frmCustomer"
" WHERE tblHelp.HelpRef = " & funIC & strHelp & funIC & ";"
The Help form is very straight forward. It displays the help, and has two buttons. One button closes the form. The other button allows you to edit the form. When you select "Edit", the button caption changes to "Lock". Select "Lock" and it changes to "Edit". When you edit, there is a third button visible. That button allows you to insert bullets in Microsoft Access. Normally if you want bullets you have to use something like a dash. How this works is described in the Project Perfect Blog. We will not cover it again in this article. The form has the three fields from tblHelp - the reference number (HelpRef) which is hidden, the name of the help item (HelpTitle) and the text of the help (HelpText). The text boxes are called txtHelpRef, txtHelpTitle and txtHelpText. SubFormDisplay is a generic sub to set the size of the form when it opens. It is in the module modGeneric in the sample. The two buttons are called btnEdit and btnClose. Create the form and past in the code below. If you do not want users editing the form, change the btnEdit.Visible to "No".
' Purpose : Set the form size if the focus had moved away and back to the form.
' Purpose : Change the text box properties to allow editing or not.
' Button caption changes from "Edit" to "Lock" and back again. If Me.btnEdit.Caption = "Edit" Then ' Currently shown as "Edit"
Else ' Currently shown as "Lock"
Create new help records. This includes looking up the form and field name from drop down lists, and combining them to create the primary key (e.g. if the form were frmForm1, and it had a textbox txtInfo, the name would be frmForm1-txtInfo. We have not provided a description of the code used in the help maintenance form. You can just use it without having to modify any code. For those interested, it creates a value list of forms, and based on the selected form creates a value list of appropriate controls. The download also illustrates another tweak. On the Customer form is a button to show help for the window. It uses the same module. Since there is no help item for the combination of screen name and control name, it just displays screen help. This is a simple way to plug in help without putting together a Microsoft Access help file. There is no need to buy the tools to create a help file, and it allows users to update the information. I would also like to recognise the following people who provided input to the application. Alex Dybenko and Stuart McCall. Thanks guys. Please provide feedback on the application to Project Perfect. To download the sample database, click here.